Gio in report low of the day is 878.16 and 874.40 in globex . If you look at the Recap MA you will find that we had 886 as day violation level 882.5 Globex violation and 880 for average decline. Following buy day violation yesterday, We had the Positive 3 Day Rally albeit only by a few points on Ftse and Dax, not as yet on FESX, anyway it is only 2hrs into the trading day, lets us see how it pans out once US opens. I agree and my statistics say that a gap open below the Buy day low has very high odds that we will get atleast back to the Bd Low. 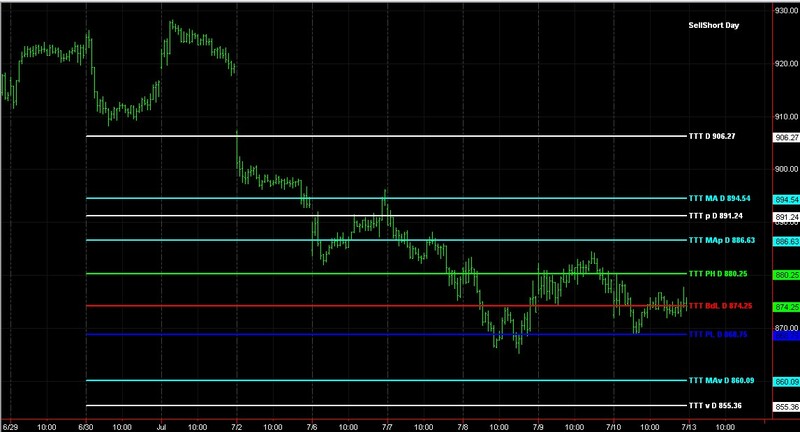 So it was a good excuse to long at the open however when the gap got close and failed to go much higher it was time to bail. This is a sample picture of it with Monday's number on it.